A white Maltese poodle named Peanut was injured in the traffic accident outside of the Alternative Sleeping Location (ASL) on Friday, Nov 16, according to LBPD Civilian Services Administrator Jim Beres. She belongs to the couple that was also injured during the crash and resulting fire. Peanut was in the parked car that was struck by a tow truck driver on Laguna Canyon Road adjacent to the ASL on early Friday morning, at 3:19 a.m. The parked car caught on fire due to the collision and was destroyed by the fire. Luckily, Peanut somehow escaped from the burning car. Later that morning around 10 a.m., a volunteer from the animal shelter that was dropping off food at Laguna Food Pantry next to the dog park saw Peanut crying in pain and running loose. The animal shelter volunteer caught Peanut and brought her to the animal shelter. In true Laguna Beach spirit, Canyon Animal Hospital donated their services for the care of Peanut, according to Laguna Beach Animal Hospital’s Laura Dunaway. The daughter of the injured couple has taken possession of Peanut and is caring for her while she recovers from her injuries. As of Tuesday, her father was still in the hospital recovering from his injuries, including a broken jaw, six missing teeth, a broken left index finger, and a back injury. “We are looking into establishing some sort of way for the community to help these people who were affected by this accident and we hope to have details on that early next week,” Friendship Shelter Executive Director Dawn Price said. On Friday, Nov 16, at 3:19 a.m., LBPD Emergency Dispatchers received multiple calls of an injury traffic collision with multiple cars on fire at 20652 Laguna Canyon Road in front of the Alternative Sleeping Location (ASL). Several officers responded and found a tow truck and another vehicle at the outbound curb, fully engulfed in flames. The flames climbed to the top of the adjacent electrical pole. According to LBPD Spokesperson PIO Sgt Jim Cota, the subjects in the roadway were dragged away from the flames and placed in police vehicles and driven to a safe location where they were treated by fire and transported to hospitals. Once the fire was out, first responders discovered a third vehicle sandwiched between the tow truck and the vehicle. The tow truck driver stated he was outbound on LCR and as he approached the ASL an inbound vehicle veered across traffic lanes and was heading head-on toward him. The tow driver said that he veered to the right and struck the parked cars. “The traffic collision investigation remains ongoing,” Sgt Cota said. On Friday, Nov 16, at 7:31 a.m., LBPD officers responded to Gelson’s Market, at 30900 S Coast Hwy, in reference to a theft of a burrito. Officers contacted the cook at Gelson’s who stated he observed a male subject enter the store and grab a burrito. Initially, officers were unable to locate the suspect. However, later at 3:56 p.m., accordingly to Sgt Cota, an officer observed homeless subject Shane Sutton walking in the Gelson’s parking lot matching the physical description of the suspect from earlier. An investigation determined it was Sutton involved in the burrito crime caper, and he was placed under arrest. Shane Michael Sutton, 32, of Laguna Beach, was arrested for felony robbery. Bail was set at $100,000. On Tuesday, Nov 13, at 8:51 p.m., LBPD officers responded to a report of a Jeep Liberty that was stolen from Huntington Beach. Officers initially did not locate the Jeep, but found it 25 minutes later. The driver was booked for possession of a stolen vehicle and for being an unlicensed driver. He was released to his parents. On Sunday, Nov 11, at 4:11 pm, an LBPD officer initiated a vehicle enforcement stop at Mountain Road and South Coast Highway. The driver, identified as Eastvale resident Tyrus Lemon Crew, 27, admitted to driving with a suspended license. According to Sgt Cota, the vehicle also had a strong odor of marijuana. The front passenger, Riverside resident James Earl Robinson III, 28, had two outstanding warrants for his arrest. Both subjects were arrested for separate drug charges. The money was seized as asset forfeiture and the narcotics were booked along with their cellphone as evidence. Bail was set at $30,000 for Crew and $20,000 for Robinson. On Sunday, Nov 11, at 8:49 a.m., an LBPD officer initiated a traffic enforcement stop at El Morro and Coast Highway in reference to a speeding vehicle. A 52-year-old Newport Beach man was cited for reckless driving and exhibition of speed. The month of November is being called “Movember,” an initiative to raise awareness about cancer, men’s health, and to raise money for charities related to researching and developing cures for all forms of cancer. This year, LBPD, with the endorsement of the Command Staff and City Manager, has decided to participate in the event and is allowing employees to forgo facial grooming standards for the month of November. “The goal of ‘No Shave November’ (www.no-shave.org) is to grow awareness by embracing men’s hair, which many cancer patients lose, by letting it grow freely,” Sgt Cota said. “The goal is to help educate others about cancer prevention, saving lives, and aiding those who are fighting the battle. On Thursday, Nov 8, LBPD officer Rock Wagner, Wendy Wagner, and James McBride filed a lawsuit against the City of Fullerton, Fullerton Police Department and three Fullerton PD officers alleging false arrest/false imprisonment, battery, negligence, civil rights violations, intentional infliction of emotional distress, defamation, and wrongful death damages after being exonerated of any wrongdoing in connection with elder abuse and fraud arrests involving Rock and Wendy’s parents. There will be a press conference today, Tuesday, Nov 13, at 11 a.m., regarding the lawsuit filed. The press conference will be held at the Ayres Hotel Orange in Orange. Officer Wagner was arrested by Fullerton PD near his Lake Forest home on November 28, 2017, on suspicion of elder abuse and fraud. His sister, Wendy Wagner, and her boyfriend, James McBride, also plaintiffs in the lawsuit, were also arrested. After the arrests, the Orange County District Attorney’s office declined to file charges in the case, finding a lack of evidence to support such charges, and finding that no crime had been committed. Officer Wagner, a 26-year law enforcement veteran, also was cleared by an internal Laguna Beach Police Department investigation. “Both of these investigations have concluded and after thorough review of the evidence produced, it has been determined that allegations of misconduct could not be supported. It has also been determined by the Orange County District Attorney’s Office that evidence of a crime did not exist,” said LBPD Cpt Jason Kravetz. The lawsuit alleges that the Fullerton PD rushed to produce public statements and circulated Wagner’s arrest mugshot and that of his sister and boyfriend to the media, boasting of its “thorough investigation,” but made no attempt to announce the fact that the case was quickly thrown out when it became evident that no crime had been committed by them. On Friday, Nov 9, at 12:41 p.m., LBPD was notified by an OC Sheriff’s Department helicopter of a stolen vehicle in Laguna Beach driving northbound on Coast Highway from Camel Point Drive. The white Ford 150 construction vehicle was recently stolen from Lake Forest. OCSD’s “Duke” helicopter assisted in the pursuit. Francis T McNair, 53, of Mission Viejo was arrested for grand theft auto. According to Sgt Cota, McNair was positively identified as the suspect who had stolen the victim’s truck. McNair was later transported to Orange County Jail. On Thursday, Nov 8, at approximately 6:30 a.m., CHP Orange County received a call from a concerned motorist reporting a solo black vehicle over the side on SR-133 northbound at Nix Nature Center. “Upon arrival, CHP officers found the vehicle and the solo male occupant, who appeared to be ejected from the BMW as a result of the collision,” CHP OC Information Officer Rafael Reynoso said. The driver of the BMW was pronounced deceased at the scene by OCFA. The deceased man’s name will be released by OCSD Coroner’s office pending notification to next of kin. The man has been identified as a 46-year-old Wildomar resident. He was driving a black 2006 BMW 3 Series when the solo fatality occurred. “The vehicle collided with a tree, then a rock ditch, which caused the vehicle to overturn several times,” Officer Reynoso said. The time of the fatal collision is still under investigation as is the cause of the accident. It is still unknown how fast the driver was traveling. However, he was not wearing a seatbelt. The most prevalent causes of single car fatalities include speed, DUI, drowsy and distracted drivers, and not wearing seat belts among other factors. “With incredible sadness, the Laguna Beach Police Department mourns the loss of Ventura County Sheriff’s Department Sergeant Ron Helus and the victims that were killed in this horrific act of violence. An incident like this can happen anywhere, so please always stay vigilant to your surroundings and please call us immediately if you feel something does not seem right or someone exhibits behavior that you feel warrants a law enforcement contact. Our police department is fully committed to this city and the safety of its citizens at all times,” said LBPD Spokesperson PIO Sgt Jim Cota. Sgt Helus was a 29-year veteran of the department and a member of its SWAT team for several years. Sgt Helus was one of the first officers to answer the call of an active shooter, rushing inside the Borderline Bar and Grill in Thousand Oaks late Wednesday. According to authorities, Sgt Helus exchanged gunfire and was shot several times before another officer dragged him away from the line of fire. He later died at the hospital. He was one of 12 people who died in the tragic mass shooting. On Sunday, Nov 4, at 6:59 p.m., LBPD officers responded to Pavilions, at the 600 block of N Coast Hwy, regarding a loaded handgun found in the men’s restroom. The person who called in the gun locked the restroom door until LBPD arrived on scene. Per the reporting person, the subjects who reported it to store management were pacing and acting very suspicious. On Tuesday, Nov 6, at 1:56 p.m., an officer responded to the Surf and Sand Hotel, at the 1500 block of S Coast Hwy, for a loaded handgun found in a recently vacated room. The reporting person locked the gun in a safe until officers arrived on scene. Also on Tuesday at 10:41 p.m., a reporting person from the Pacific Edge Hotel, at the 600 block of S Coast Hwy, called to report they had found a firearm in a recently vacated room. The guests had left the gun behind in the nightstand. It was being held in the safe until LBPD could arrive on scene. On Monday, Nov 5, at 11:36 a.m., officers were alerted by LBPD dispatchers of a stolen vehicle in the city. An officer spotted the red 2008 Toyota Highlander on Laguna Canyon Road near the ASL and trailed it as it turned onto El Toro Road and then onto S/B SR-73 until other officers arrived to assist. OCSD units also responded to assist. A search of the vehicle also revealed Fluor was in possession of burglary tools. Both suspects were taken into custody and brought to the station and booked. Andrew Chase Fluor, 35, of Newport Beach, was charged with impersonation of another individual, possession of stolen property, violation of a restraining order, and possession of burglary tools. Bail was set at $35,000. Lisa Renee Stines, 31, of Laguna Beach, was charged with possession of stolen property. Bail was set at $20,000. LBFD put out an alert Thursday morning reporting they needed the community’s help in finding the City’s goat herding dog, Shandu. “Shandu went missing this morning at 7 a.m. from the area of Morningside and Starlit in Bluebird Canyon. If located, please contact Ana Neira in the Fire Department at (949) 497-0305 or (949) 497-0701,” LBFD officials said. On Wednesday, Oct 31, at 2:30 p.m., an occupied vehicle check was conducted to the back of the Mobil gas station at the 100 block of N Coast Hwy. According to drugtimes.org, the street value of meth is $60 to $300 per gram ($1,080 to $5,400 for 18 grams). Monique Marie Altierra Castillo, 41, Santa Ana, was booked and transported to OC Jail. “Castillo claims to be homeless and provided the ASL’s address for her residence,” Sgt Cota said. On Thursday, Nov 1, at 11:33 p.m., LBPD officers were alerted of a Honda Pilot stolen from Garden Grove earlier in the day. Officers located the vehicle within two minutes. Two Santa Ana residents were detained and subsequently placed under arrest for vehicle theft, Cristian Carlos Chavez, 20, and Michelle Esther Mullins, 21. The victim responded to pick up his car. He was very appreciative of the officers’ work. On Tuesday, Oct 23, at 11:14 p.m., LBPD and LBFD personnel responded to the 500 block of Saint Ann’s Drive for a dispute between neighbors involving one allegedly using pepper spray on the other. Emergency personnel arrived and contacted both parties. The not so neighborly conduct included one neighbor allegedly spraying the other with pepper spray. On Tuesday, Oct 30, at 1:15 a.m., LBPD officers responded to a residence in the 400 block of Broadway Street for the report of the sound of someone walking on the resident’s roof. Officers arrived and observed a male suspect in the backyard of the property. At 3:23 a.m., officers responded to a residence in the 300 block of Holly Street for the report of suspicious noises on the roof and back deck of the residence. Officers arrived and were informed by a neighbor that he saw a male subject in a nearby alley. According to Sgt Cota, he was the same suspect as the one from the earlier Broadway Street call. “Homeless subject Ryan Vincent, 26, told officers that he had arrived in Laguna Beach yesterday and claimed that he was just trying to find a place to sleep,” Cota added. Ryan Vincent, 26, of Newport Beach, was placed under arrest for prowling and resisting arrest. On Wednesday, Oct 24, at 5:23 pm, LBPD officers responded to a residence in the 1100 block of Gaviota Drive in reference to an unknown male subject passed out in the backyard of a private residence. Officers contacted the male and after first providing a false name, he was later identified as San Juan Capistrano resident Timothy Stephen Meek, 27. According to Sgt Cota, Meek was arrested for false impersonation and petty theft. A record check revealed Meek had nine outstanding warrants. He was taken into custody and transported to OC Jail. According to police logs, bail was set at $20,000. On Friday, Oct 26, at 11:44 a.m., at the 900 block of S Coast Hwy, LBPD officers were dispatched to a report of two women who had passed fake $100 bills in a store. Officers arrived on scene and located the two suspects. The reporting person positively identified them as the two suspects who gave fake $100 bills. Both suspects were described as wearing small tank tops, one with abdomen tattoos. A few minutes later the females told officers that Kenny’s car had just driven by the location. The vehicle, described as a grey Toyota Corolla, drove back around and officers were able to stop the vehicle and contact the driver, Rancho Cucamonga resident Kenneth Pecaro. A lengthy investigation was conducted and all three were arrested for Burglary and Forgery/Counterfeiting, including Makayla Cooper, 23, Taylor Alissa Hubbard, 21, and Kenneth James Pecaro, 46. Bail was set at $20,000 for Hubbard. No bail was set for Cooper or Pecaro. On Tuesday, Oct 23, at 3:11 p.m., an LBPD officer was walking to the Chamber of Commerce at 357 Glenneyre Street when “he came into contact with two homeless subjects, Eli Lopiccola and Matthew Benusa, who were drinking alcohol,” LBPD Spokesperson PIO Sgt Jim Cota said. 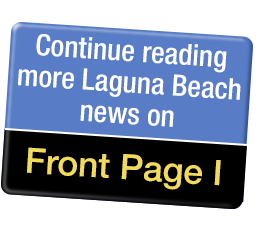 Matthew Paul Benusa, 32, of Laguna Beach, was arrested for resisting an executive officer, which is a felony, and Eli Richard Lopiccola, 46, of Laguna Beach, was arrested for public intoxication. Bail was set at $500 for Lopiccola. Bail was set at $20,000 for Benusa. Since Friday, Oct 19, Michael Matekel, 30, of Laguna Beach, has been cited or arrested four times in five days for trespassing. Matekel was previously warned and was taken into custody and later released with a court date. On Sunday, Oct 21, at noon, an LBPD officer tried to contact homeless subject Kyle Blaker for littering in the area of Calliope Street and South Coast Highway. Two more officers responded and assisted in getting Blaker detained in handcuffs. Kyle James Blaker, 33, of Laguna Beach was subsequently taken into custody for littering, providing a false name to officers, and violation of his parole terms. On Friday, Oct 19, at 10:31 a.m., LBPD officers responded in reference to a reported theft of political signs. “The reporting party observed the suspect taking the signs from in front of Ruby’s Diner and leaving in a black Bentley. The suspect was located in the 600 block of North Coast Highway in the black Bentley with several “No on P” signs in the rear passenger seat of his vehicle,” LBPD Spokesperson PIO Sgt Jim Cota said. The signs were returned and a police report was taken. No arrests were made although the reporting parties indicated they would be seeking further action. “LBPD has sent the report to the District Attorney’s Office in Newport Beach. They will review the report and determine whether or not charges will be filed based on the circumstances of the incident,” said Sgt Cota. The suspect was described as a white male, 35 to 40 years old, wearing a light colored dress shirt and slacks. The Bentley is reportedly not registered in the suspect’s name. In response to the incident, LBPD Chief Laura Farinella said, “On a daily basis the Police Department is responding to calls related to the theft of political signs. Officers are taking reports and investing these incidents. Additionally, due to frequent complaints the city receives regarding the placement of these signs, there is a daily effort from Code Enforcement to monitor public property and remove signs that are not placed on private property. Chief Farinella also pointed to the city’s current ordinances, MC 25.54.012 and MC 25.54.014, which state that election signs shall not be placed in the public right of way, however, may be placed on private property. “I truly hope we can all conduct ourselves in a kind and professional manner during this campaign season,” Chief Farinella said. Editor’s Note: Stu News Laguna has elected as a matter of policy not to run the suspect’s name until (if) charges are announced by the OCDA. On Monday, Oct 22, at 12:42 a.m., at the 1900 block of Laguna Canyon Road, LBPD and LBFD personnel responded to the 1900 block of Laguna Canyon Road for the report of a rollover traffic collision. The driver, a 45-year-old Laguna Beach resident, sustained a cut to her hand but declined transport to the hospital. Alcohol was not a factor in the collision. LBPD and LBFD were working with Frontier to get a new pole installed last night, according to Sgt Cota. LBPD sent out several Nixle alerts following the collision. The first alert was sent at 1:36 a.m., warning that traffic would be closed in both directions until further notice. At 5:11 a.m., a second alert read, “still closed in both directions until further notice, “due to an accident resulting in low hanging wires.” At 9:24 a.m., LBPD sent out a third alert, “expect heavy delays in both directions for the next four to six hours. Use alternate route if possible.” At 2:30 p.m., LBPD sent out a final alert reporting that the pole repair was complete and all lanes were opened. On Friday, Oct 19, at 12:55 a.m., an LBPD officer stopped a bicyclist in the 1700 block of Laguna Canyon Road with no front light and rear red reflectors. The bicyclist, homeless resident Robert Caltabiano, had an outstanding $5,000 warrant for his arrest. Robert Lenn Caltabiano, 46, of Laguna Beach, was arrested and booked at the Laguna Beach Police Department.